there was green fluid (guessing antifreeze) misting off the top of te motor kinda. 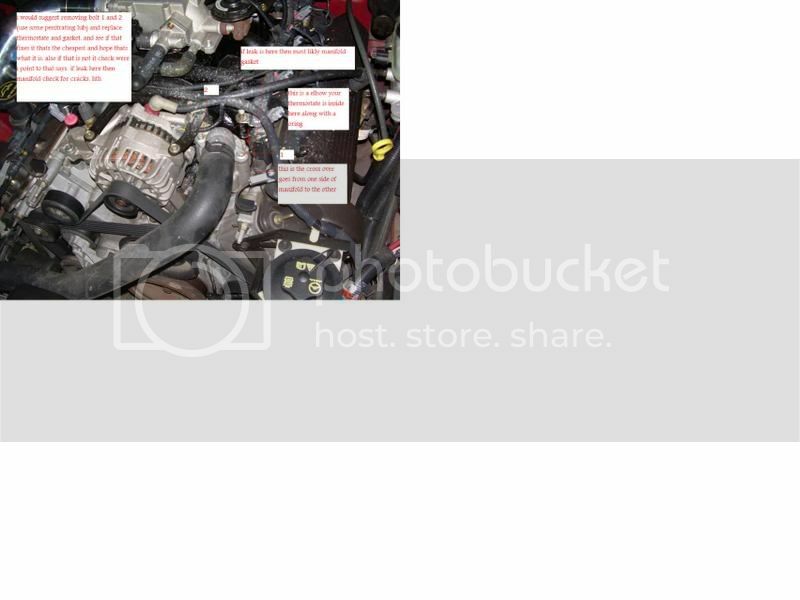 its right where the thick radiator hose connects to a metal thing and that metal thing is sitting on the motor. was told this is the waterpump, and its either a 6$ o-ring or worst case a 30$ waterpump. anyone had this happen before? pretty sure its the aluminum crossover. ill snapsome picsand postem when i get back from work im on lunch right now and i gotta head out. Help us out here, what year is your car? ok heres the pics. its alum crossover if that makes any diff. its comming fromnear this metal thing thats attached to the rad hose. its spraying up, so its not comming from the rad hose. pic 2 shows a question mark to whatever this metal thing was that i was told is the waterpump. its comming from inbetween this metal thing and the aluminum crossovers somewhere where this metal thing connects to the motor. pic 3 = somewhere around there. i couldnt tell if it was comming from the top or bottom of this thing, as it was misting a good 6-8 inches into the air and i wasnt gonna stick my face in a bunch of boiling antifreeze to see where this leak was. like, what is this metal thing, are there gaskets that could cause this leak, and how hard would this be for me to fix myself? preciate any input anyone has. im not really wanting to take this to a ford dealer to get robbed out of 900$ for something that probably costs 20 bucks. can u send me the link where its hosted or something, pic is too small to read anything u put on it :-/.